After 141 oil train derailments and fires in 2014, US federal regulators were forced to devise new rules for the vehicles. However, the regulations have sparked criticism from nearly all interested parties, including politicians and activists. The trains in question are often called “bomb trains” because their black, torpedo-shaped tanks are filled with potentially explosive crude oil. They are an increasingly common sight on the nation’s rail systems as they carry a million barrels of oil per day to refineries along the East Coast. The Department of Transportation (DOT) spent two years formulating the recently released new train rules. The regulations introduce new tank car standards for oil and ethanol, and mandate the use of electronically controlled brakes. "The truth is that 99.9 percent of these shipments reach their destination safely," DOT Secretary Anthony Foxx said to the press. "The accidents involving crude and ethanol that have occurred, though, have shown us that 99.9 percent isn't enough. We have to strive for perfection." 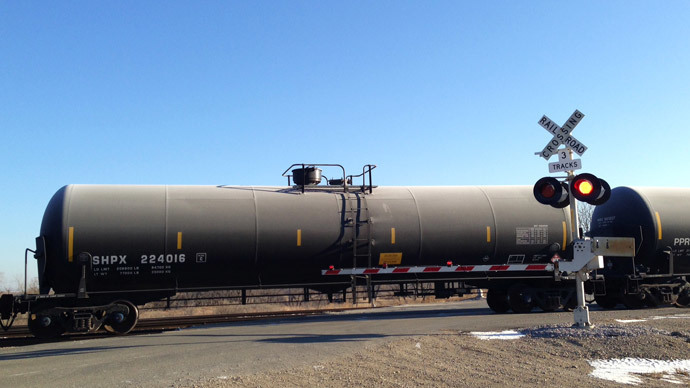 Under the new rules, the oldest and least-safe tank cars, DOT-111s, long known to be inappropriate for transporting flammable material, would be replaced with the jacketed version of newer cars called CPC-1232s within three years. These would have thicker shells, higher safety shields and better fire protection. Unjacketed CPC-1232s will be phased out within five years. There has been criticism over how much time has been allotted to making the change over, including from Sen. Chuck Schumer (D-NY). “The good news is that the standards are predictable, but the bad news is that the phase-out time is too lenient,” Schumer told The New York Times. Schumer, along with six other senators, introduced a bill that would seek a $175 fee per shipment made on older cars in order to speed up their removal from use. The new rules will cost the industry $2.5 billion over the next two decades, according to DOT estimates. Last month, DOT set lower speed limits, lowering them from 50 to 40 mph, for oil trains going through urban areas in Philadelphia, Albany and Chicago. Notably, the tankers in use were actually the newer CPC-1232s that DOT is hoping to phase in, and at 33 mph the train was moving even slower than the agency’s new rules would mandate. In July 2013, 47 people died in Canada after a runaway train derailed and exploded in the city of Lac-Meganti, Quebec. Local and state officials have also been critical about difficulty in predicting when an oil train will pass through. Nonetheless, the new rules fall short of insisting that railroads notify communities of oil train traffic. Railroad companies will only be required to have a “point of contact” for information related to the hazardous material. A recent study by the US Department of Transportation forecasts 207 train derailments over the next 20 years involving oil and ethanol trains, causing billions of dollars in damages and untold loss of life.